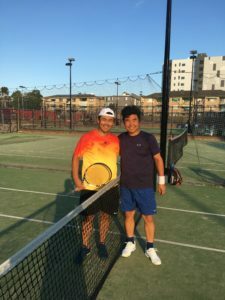 There’s been plenty of tennis action happening at Strathfield Sports Club to round out 2017, with our Club Championships, Round Robin and Spring Badge all finishing up in recent weeks. Here’s a wrap of the highlights and results and make sure you get in touch with the Club if you want to be a part of any of our competitions in 2018! SSC’s annual Club Championships took place last weekend, with the fine weather matched by some quality tennis from our tennis members. Congratulations to Patrick Stauton who proved too strong for Mark Padd in the Open Men’s Final, taking out the “super-set” 9-3. Mark combined with Charles Hemple to claim the Open Men’s Doubles crown, defeating Daryl Hart and Dane Jones 9-3 in the final. Meanwhile Daryl and Dane backed up to win the Men’s Over 50 Doubles final, edging out Mark and Rod James 7 games to 6. Marcin Matusiak was also a winner on day, taking out the Consolation Singles final against Bob Bow 9-4. “It was a great day. 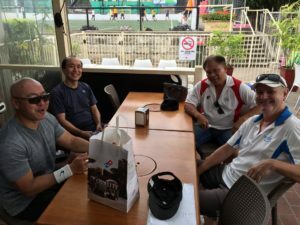 There was a good turn out and the tennis was all played in the right spirit,” said Vice President Mark Padd following Saturday’s event. “It was great to get the chance to play against some players you might not normally hit with and to make new friends off the court too. “We’d like to emphasise that the day really is for everyone, so we’d like to get an even bigger turn out next year. Our Tuesday night Round Robin competition has also recently concluded, with a big thanks to organisers Mrigesh, Shanta and Liang. There was a great turn out for the final, with over 20 players, members and friends turning out to cheer on the contestants. 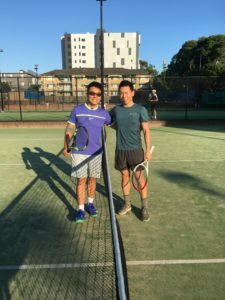 They were treated to some excellent tennis as Division 1 final went right down to the wire, with Sunny staging a miraculous comeback to defeat Steve Chen 5-7 7-6 7-5. Sunny was down a set and a break in the second set and saved three match points before squaring the ledger in a tie-break. 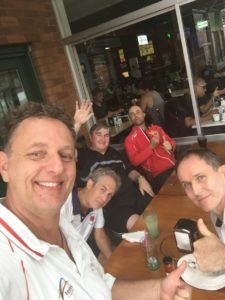 He was again down 5-2 in the decider and staring at defeat but saved multiple match points before rattling off five straight games to claim the win! 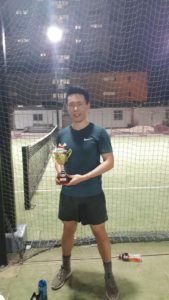 The Division 2 final was also tightly contested with Robert Moh proving too strong Sang, claiming a 6-2 6-2 win. “A big thank you to the Club and everyone who turned out to make the final such a memorable event,” said Steve Chen. 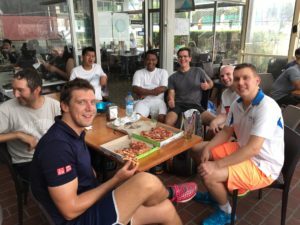 “We were treated to some great tennis, excellent prizes and yummy fried chicken! 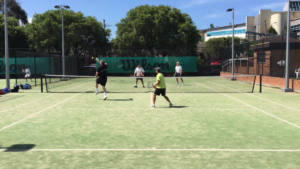 SSC was proud to enter a mixed team in Tennis NSW’s Division 1 Spring Badge for the first time in a few seasons. Congratulations to Alex Chen, Tomiharu Kawahashi, Yurie Hori, Kiyomi Kawahashi, Daryl Hart, Eri Jinnaka, Jenny Chen, David Hansen and Charles Hempel who were all part of this successful campaign. The team finished third overall with four wins and two losses throughout the season, in what was a very close competition. After some great Badge results this year the Club looks forward to entering even more teams in 2018!